This easy drumstick recipe is exactly that, easy with only 5 minutes of prep and 6 ingredients. The rest of the time is spent cooking on the stovetop while you are free to do whatever, make a side dish, take a break, or bathe the kids. 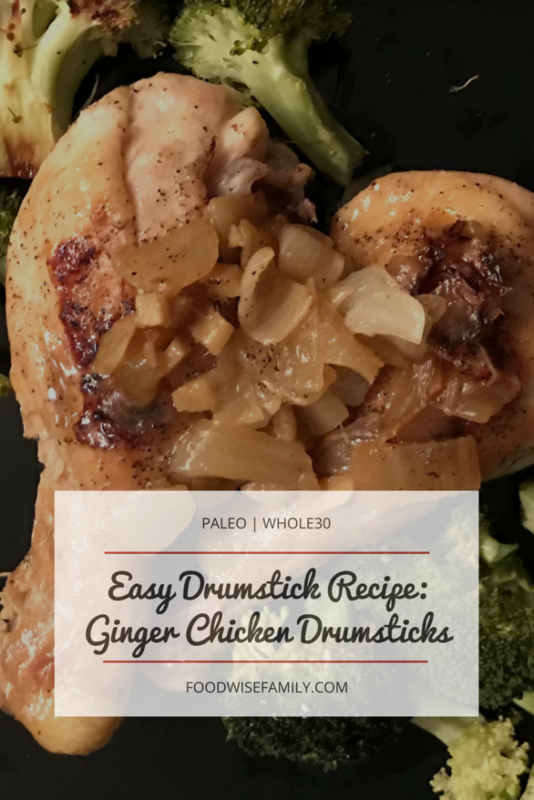 This ginger drumstick recipe is Whole30 compliant, paleo, and produces a gingery sauce to top your chicken. 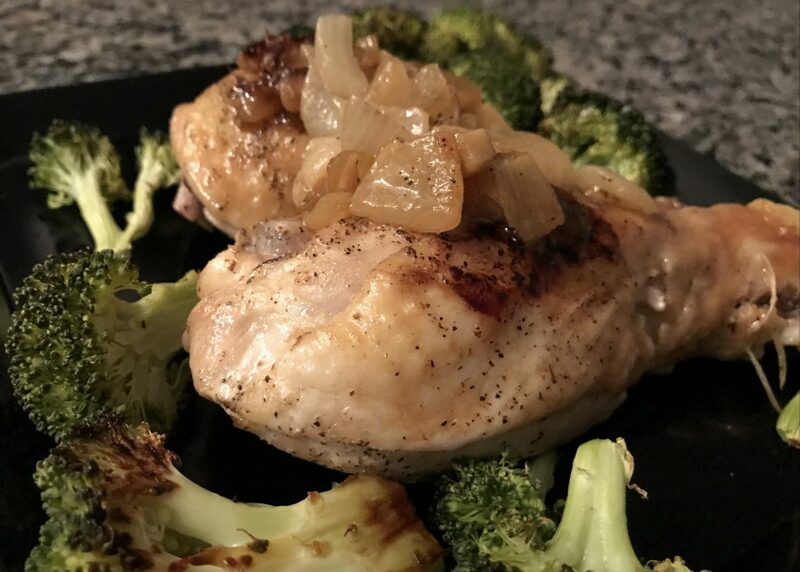 Moist, juicy drumsticks with a gingery sweet onion sauce are a cinch to make and they go beautifully with roasted veggies. We often eat this with roasted broccoli. I don’t know if chicken drumsticks come without skin, but make sure you buy this with the skin on. The skin lends to keeping the chicken moist and the fat on the skin melts off helping to make the ginger sauce as the chicken cooks. Heat two tablespoons of extra virgin olive oil in a large saute pan over medium heat. Add one large diced sweet onion and two tablespoons of freshly minced ginger and saute until onions are clear. Make sure onions and ginger are evenly spread across the pan. Add six drumsticks to the pan in a single layer on top of the onions and ginger. Sprinkle 1/4 teaspoon of salt and 1/4 teaspoon of pepper over the drumsticks. Cover pan and cook on medium heat for 5 minutes. Flip drumsticks. 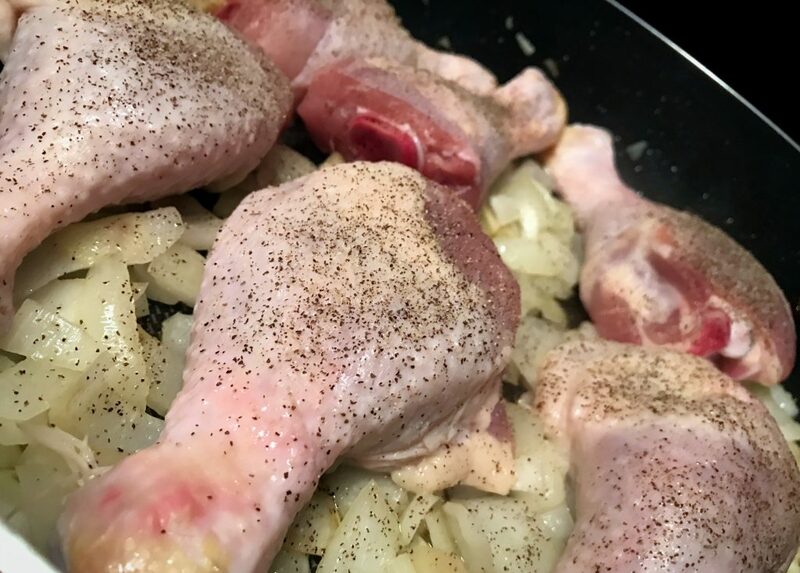 Sprinkle another 1/4 teaspoon of salt and 1/4 teaspoon of pepper over the drumsticks. Cover pan and cook on medium low heat for 35 minutes. Make sure chicken is cooked thoroughly. Bonus: the chicken fat and the water from ginger and onion produced an awesome ginger sauce as it was cooking. Serve drumsticks with the ginger sauce and onions, and your favorite side dish. What’s your favorite side dish with drumsticks? Share below in the comments. I love finding out everyone’s favorites. 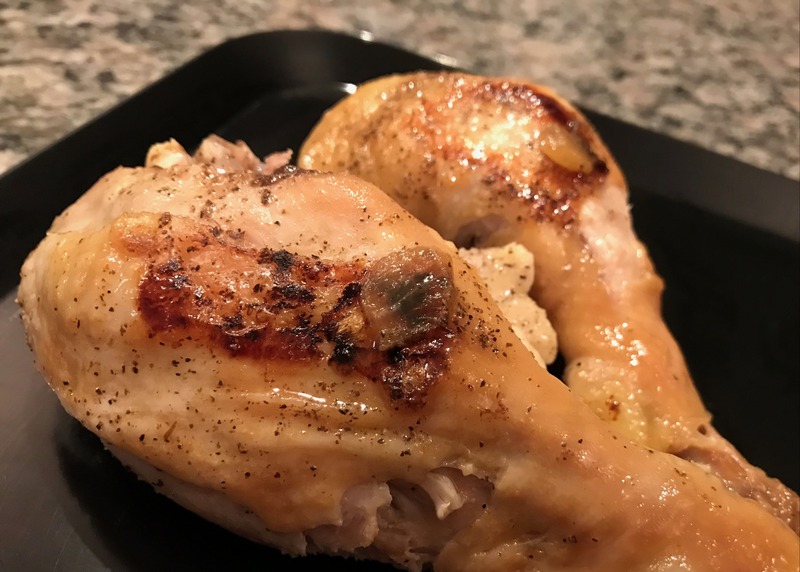 This easy drumstick recipe is exactly that, easy with only 5 minutes of prep and 6 ingredients. 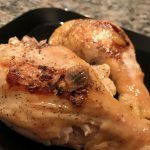 This ginger drumstick recipe is Whole30 compliant, paleo, and produces a gingery sauce to top your chicken. Add onions and ginger and saute until onions are clear. Make sure onions and ginger are evenly spread across the pan. Add drumsticks to the pan in a single layer on top of the onions and ginger. Sprinkle salt and pepper over drumsticks. Cover pan and cook on medium heat for 5 minutes. Flip drumsticks. Sprinkle the second round of salt and pepper over drumsticks. Cover pan and cook on medium low heat for 35 minutes. Make sure chicken is cooked thoroughly. 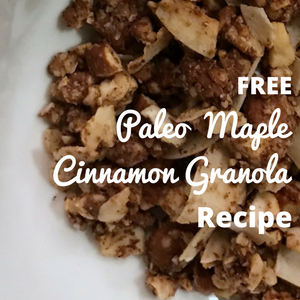 While I haven’t tried to recipe it does look yummy. Thanks! I love the ginger flavor in this dish.